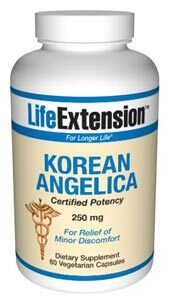 Korean Angelicas has often been used for pain relief due to its benefits and safety. Pain can be extremely debilitating, whether it is acute or chronic and can restrict a person’s lifestyle. The main concern when focusing on handling pain relief is to ensure the safety of the patient. Drugs can work at relieving acute as well as chronic conditions, but there are a host of side effects that can be serious and fatal in some cases. These medications affect the abdomen, kidney and liver, among other organs and may cause severe damage if used without proper care. Through scientific research it has been established that Korean Angelica is very useful for pain relief management. Effective in managing chronic and acute conditions like arthritis or even injuries, this herbal extract alleviates the discomfort without the harmful side effects that are commonly witnessed through the use of analgesics. Research has shown that it also has components that help protect the nervous system from age-related decay. Additionally, it is beneficial in inhibiting the cell growth factor to limit critical cancer from spreading in patients. It is considered a safe and dynamic method of pain management in recent times and there is continuing research utilized intended to develop different products using the herb Korean Angelicas for pain relief. South Korean medicine is known for its dependency on herbs and there are centuries of traditional medical scripture that support the research and application of different hearbs utilized in the Orient. One of these herbs is the Korean Angelicas used for pain relief. It is considered a safe extract that works on the central nervous system and does not have the side effects of allopathic medications. Korean Angelica is one pain reliever that works on the central nervous system to blunt or even eliminate the different types of pain suffered by a person. This is in contrast to the allopathic medications that simply inhibit the specific cyclooxygenase enzymes in the human body to control pain. It works on eliminating aches and functions as a broad-spectrum pain reliever that has no toxic side effects. One of the specialized forms of Korean Angelicas used for pain relief is called the Angelica gigas Nakai. It is the only form of this herb, which has exceptionally high doses of unique phytochemicals called decursinol and decursin. It is not found very commonly in South Korea and can be located in selective places. However, due to its fabulous properties in assisting with pain relief, it is one of the fastest growing products sold in South Korea as well as purchased by people who are into Oriental medicine across the globe. The active ingredients are extracted from Korean Angelica to enhance its effect on the human body. It immediately starts working by releasing its analgesic effects on the human body and provides almost instant pain relief.